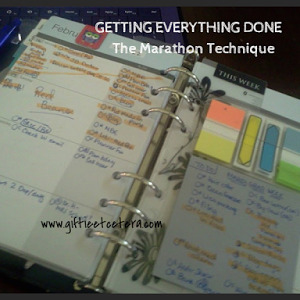 But I think the advantage of having a plan and a list is that when the motivation, time, or energy arises, being able to get a large chunk of stuff done is as easy as flipping to your pre-made list! I like to do this on Mondays. It's the day of the week when I'm most motivated and tend to stay home all day. It's SO satisfying to get to the end of the day with a bunch of stuff marked off. And like you, my favorite method of marking is highlighting.